Great views.Good coffee.Varied seating.Close to gates. A progress chart for airport lounge quality in the last ten years would look something like a giant U. They were once refined spaces where frequent flyers could unwind, wanting for nothing, they then became Grand Central Terminal, where a cup of coffee was considered a luxury – and now they’re back. 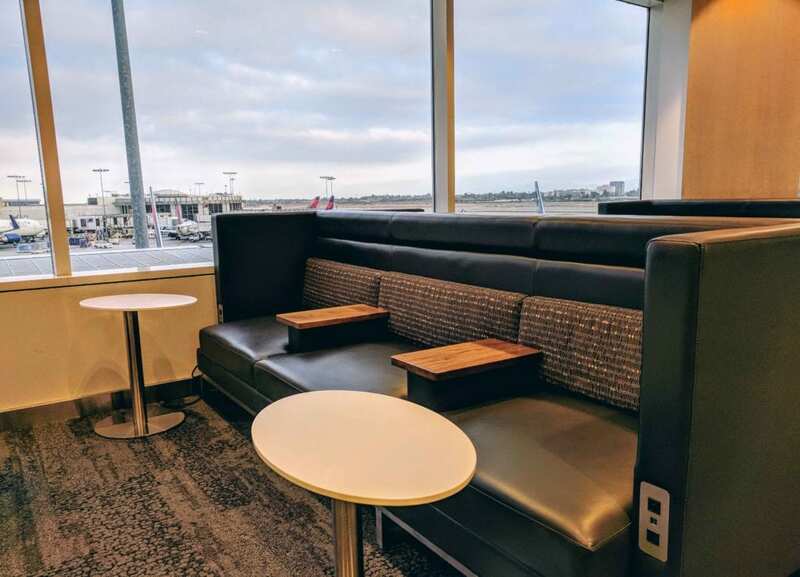 The Delta Sky Club at LAX Terminal 2 proved to be a perfectly palatable way to spend the morning before a series of long flights, so here’s what to expect in this SkyClub lounge. Terminal 2 at LAX is fairly small, without a long walk to virtually any gate. The Delta Sky Club is located upstairs from the terminal, and even if you don’t have access, you should walk up the stairs. Once upstairs you’ll find cozy seating areas which could easily be an airport lounge, which hardly anyone seem to use. Enjoy that! As a Sky Club member, Delta One customer or Amex Platinum cardholder, you can enter the Delta SkyClub at LAX Terminal 2 free of charge. Do note, Delta domestic first class does not gain access, only tickets that say Delta One. Upon entering I was very impressed to find seating options both left and right of the entrance, with excellent tarmac and runway views. To the left you’ll find a larger, more waiting room style space, whereas to the right (if facing the windows) you’ll find a more narrow corridor, which inherently feels more private. Wherever you end up, sit near the window – the views are pretty phenomenal, and who doesn’t love a bit of pre flight plane spotting? First impression: gone is the tarnished old furniture and in are some great accent colors, versatile spaces and vastly improved beverage operation. The food was certainly improved, too. While unremarkable from a design perspective, the functionality of the Delta Sky Club has vastly improved. Power ports can be found at virtually every seat, wifi is more than capable and there’s an impressive array of individual, couple or group seating options, as well as functional office style spaces. Two bars, both with Starbucks coffee machines capable of making espresso, (or help yourself drinks) make it very easy to stay caffeinated, hydrated or lubricated in transit. The large windows and wonderfully colorful California inspired photo prints throughout the space gave it a unique, personable feeling – at least by airport standards. I knew I was in LA, and I loved it. I was positively surprised to see scrambled eggs, yoghurt, granola and even chia seeds available for breakfast. It wasn’t long ago you’d be lucky to find bagged carrots, and even rabbits get tired of those, let alone health conscious travelers. Delta has impressive Starbucks brewing machines, capable of making a commendable double espresso, and a nice selection, including almond milk, made for a great morning brew. But the real triumph here is the evolution of lounge drinking. Delta Sky Club serves top quality Hangar 1 Vodka and Damrak Gin and a great selection of micro brews. They’ve also added cocktail stations with ample lemons, limes, bitters and other quality mixing ingredients. It’s now actually pretty easy to make these DIY airport cocktails. I did not notice a premium bar in this particular location, and therefore no opportunity to cash in Skymiles for Dom Perignon, but we live and let live. This is not an airport lounge you rock up to five hours early to enjoy curated celebrity chef dishes, or bespoke cocktails designed by the worlds top mixologists, or for that matter a free pre flight massage, but this is a highly functional space designed to enhance the journey of a traveler. I won’t spend too much time dreaming of the day I return to this SkyClub, unlike places such as the Virgin Atlantic Clubhouse at Heathrow, but I wouldn’t hesitate to stop in for a great pint, a nice breakfast and some relaxing plane spotting before a flight. Anything else is just a plus. I was just there a few days ago..the shower rooms are great but I’m hoping they rebuild like the Delta One check-in they had at the old terminal. I booked a ticket in business mainly to experience that whole thing and then they switched it on me.